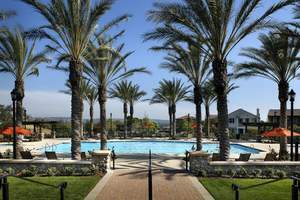 AZUSA, CA--(Marketwire - Sep 11, 2012) - This year, master-planned community Rosedale in Azusa welcomed new residents Mathew and Valerie Biller. The couple started a new chapter in their life when they purchased their first home and weeks later, rejoiced in the birth of their first child. 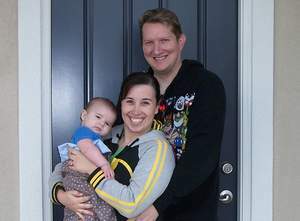 Formerly West Covina apartment dwellers, the couple now enjoys a four-bedroom, 2.5-bath Mapleton home, as well as several community amenities at Rosedale. "It took about a year for us to find the right place," noted Mathew. "We kept our eyes on Rosedale, and after seeing KB Home's Mapleton neighborhood the day before it grand opened, we fell in love with the models and appreciated the price point." No walls attached to neighbors, plenty of parking, and a great design were quite the upgrade from a one-bedroom apartment, noted Mathew. The Billers were also attracted to Rosedale's location, near Mathew's hometown of Diamond Bar, and providing quick freeway access to Los Angeles. "Location!" exclaimed Mathew. "Rosedale's perfectly located. Plus, my wife grew up a few blocks from here, and it's special knowing that we'll raise our family here, too." Other than cherishing their new bundle of joy, Mathew and Valerie are parents to three cats. "It seems like residents are all issued a four-legged companion in the Azusa foothills," said Mathew. "We go for walks every night. I've never done that in my life, but I love doing it here. We've got amazing sunset views of the city. I take pictures on my cell phone almost every night." Boasting more than 200 sales year-to-date, Rosedale is among the top-selling master-planned communities in Southern California. To learn more about Rosedale, visit LiveRosedale.com or call (800) 928-1275. To see what's going on in the community, visit https://www.facebook.com/liverosedale. Ownership and development management of the 518-acre master-planned community of Rosedale in the city of Azusa, CA is a new partnership between Brookfield Homes, Christopher Development Group (CDG) and Starwood Capital Group. As Rosedale Land Partners, these companies bring together the necessary depth of large-scale community planning, development and financing experience required for the successful implementation of community-based master planning and development. For more details, please visit http://www.LiveRosedale.com. The Biller family in front of their Mapleton home at Rosedale in Azusa. The Biller's have access to Rosedale's 4,500-square-foot private clubhouse and two-acre recreation center, featuring this Junior Olympic swimming pool.